What I love about slow cooker recipes is that they can be fast supper fixes for busy schedules. Prepare the ingredients in the morning, put them in this wonderful machine and you are all set. Your meal will be ready when you come back from work. To make it even easier, you can prepare all the ingredients before going to be and start the machine before you go out to work. This way you don’t have to overload your already busy morning routines. Of course, even if slow cooking is easy, you still need to prepare the ingredients: cut the veggies, brown the meat. The first time I used the slow cooker, my husband said: I thought this machine did all by itself. Yes it cooks but unfortunately it does not cut the veggies… Even if slow cooking recipes still need preparations, you don’t have to worry about what to serve for dinner when you come back from work. It makes evenings less stressful. I usually use my wonderful machine at least once a week. During my last shopping trip, I stumbled on a great deal on a beef roast. I used it in my following slow cooker recipe. 1 teaspoon of saffron. I love this spice because it adds so much flavor to meat and rice too. Other possible additions: You can add carrots, parsley. I did not use them for this recipe. The secret in slow cooking is to brown the meat. In a large skillet, heat the oil, onions and saffron for few minutes until onion is browned. In a cup: mix the olive oil, salt, pepper and garlic. Coat the meat with the mixture. Then add the meat to the skillet. Brown it on each side for few minutes. 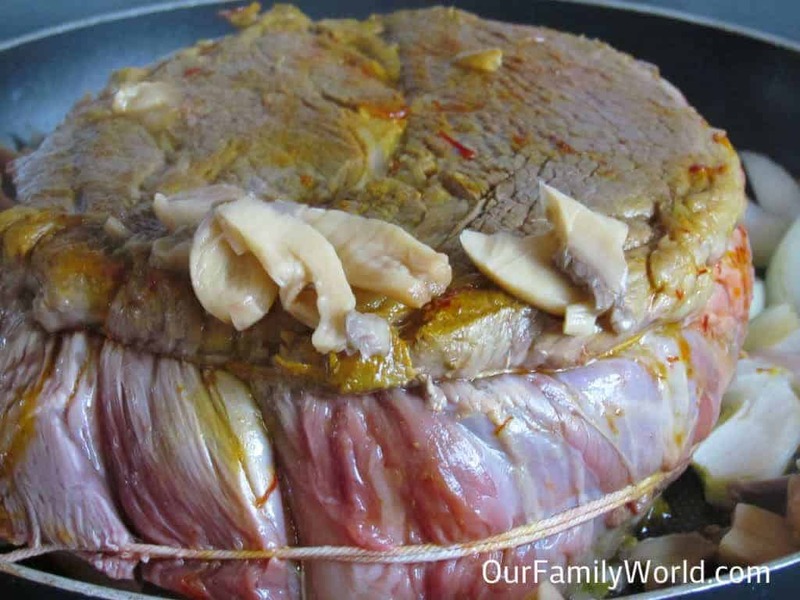 Place roast in the slow cooker. 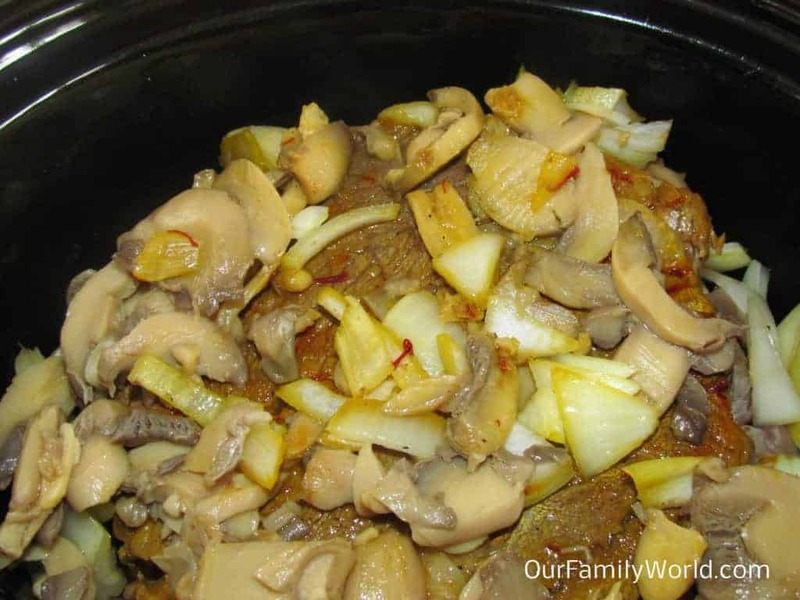 Add the mushrooms, broth and let it cook for 5 to 6 hours on high or until meat is tender. You can serve this beef saffron with white rice and some of your favorite green vegetables. 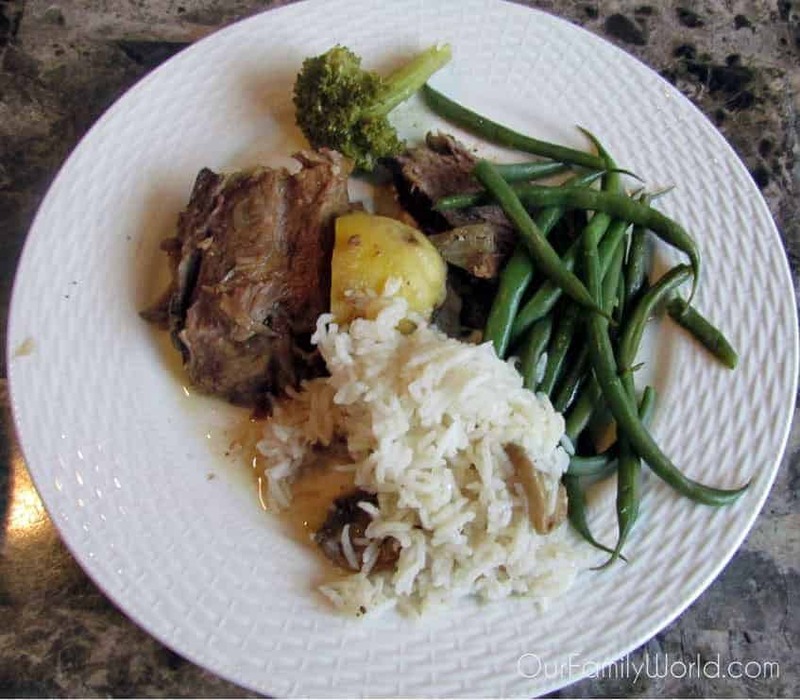 It adds color to this easy and yummy slow cooker recipe. What is your favorite recipe using this wonderful machine? I would love to read from you. For other yummy and fast slow cooker recipes, check our cooking section. You don’t want to miss this Veal, Apples and butternut squash slow cooker recipe! Hello There. I discovered your weblog the usage of msn. This is a very smartly written article. to read extra of your useful information. Thanks for the post. For latest information you have to pay a quick visit world-wide-web and on the web I found this web page as a best site for most recent updates. That looks and sounds so delicious! This looks really yummy!! Your pictures are amazing, I can almost smell it!!! Thanks Janet! I try tons of pictures before accepting one! The saffron is a great addition to the flavor.